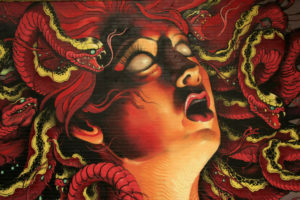 In Greek mythology, Medusa was a winged monster with snakes for hair that no mortal could look upon and live. The first person to properly explore her origin story was Ovid, who described a beautiful maiden raped by Poseidon in the temple of the virgin goddess Athena. As punishment, Athena turned her hair to serpents and created a face so terrible that it turned people to stone. The myth is as prescient now as ever. After all, 43% of white women believe Brett Kavanaugh was telling the truth when he denied pinning Dr. Christine Blasey Ford to a mattress, forcibly trying to remove her clothing, and covering her mouth to stop her from screaming—while his friend watched and laughed. And it was a woman, Sen. Susan Collins (R-Maine), a champion of women’s reproductive rights, who cast the decisive vote in favor of Kavanaugh. Collins sold her soul to the Republican Party, and explained her vote in a rambling speech that ended with her fervent hope that Supreme Court Justice Brett Kavanaugh would reduce polarization in the Supreme Court and society. Supreme Court Justice Brett Kavanaugh. It still hurts to write. We lost and it hurts. It hurts badly. A whole new generation is learning the truth: society doesn’t care about violence against women because the people in power don’t care. Ford offered powerful testimony before the Senate Judiciary Committee, moving many women to tears as she described the alleged attack. Days later at a campaign rally, Donald Trump mocked her before his mostly white audience. To no one’s surprise, his comments were met by laughter and applause. “Betray the patriarchy and your whiteness won’t save you,” Alexis Grenell wrote in an opinion piece in The New York Times on white women’s enduring support for the Republican Party, which values their whiteness while it denies them basic human rights. After the tape was made public, a Washington Post/ABC News poll found that most people— 70% of respondents—believed Donald Trump had made unwanted advances against women. But 64 percent of all respondents and 84 percent of Republicans admitted it would not influence their vote. A similar phenomenon can be seen with Brett Kavanuagh, who is spectacularly unpopular with people of color. A stunning 83% of black and 66% of Hispanic voters believe Ford was telling the truth. Almost all of them opposed his nomination. In contrast, after the sexual assault allegations were made public, Kavanaugh’s popularity actually rose among Republicans, 83% of whom are white. Betray the patriarchy and your whiteness won’t save you. When your sexual assault is inconvenient, the president will laugh at you too. Resist. It’s hard to hope right now, but you matter. So do your experiences. So, please vote on Nov. 6. If you give up, they win. Support women. If you’re a white woman, support your black, Latina and indigenous sisters in their struggle for equality. Don’t know where to start? Follow feminists from other races, ethnicities, and cultures on on social media. It’s a great way to learn. But remember, “I’m not like that” isn’t helpful. You know how when you vent about men there’s always the one guy takes it personally and explains he’s different because #NotAllMen? Don’t be that guy. Get empowered. You can’t change the world overnight, but you can change yourself. Learn how to defend your personal space, protect yourself from sexual coercion, and speak up when guys make crass comments about your body. Love yourself. Not sure how? There’s a list at the bottom of this short article.